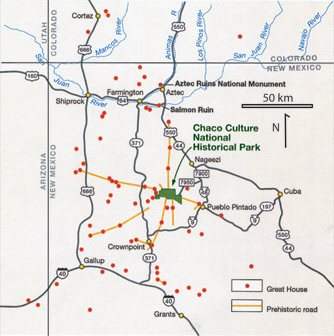 CHACO CULTURE NATIONAL HISTORIC PARK, NEW MEXICO – Preparing to leave Chaco and move on to explore another nearby Native American site at Canyon de Chelly, Arizona, our INHL Team discusses the connections between Chaco and other regional centers of population and trade. 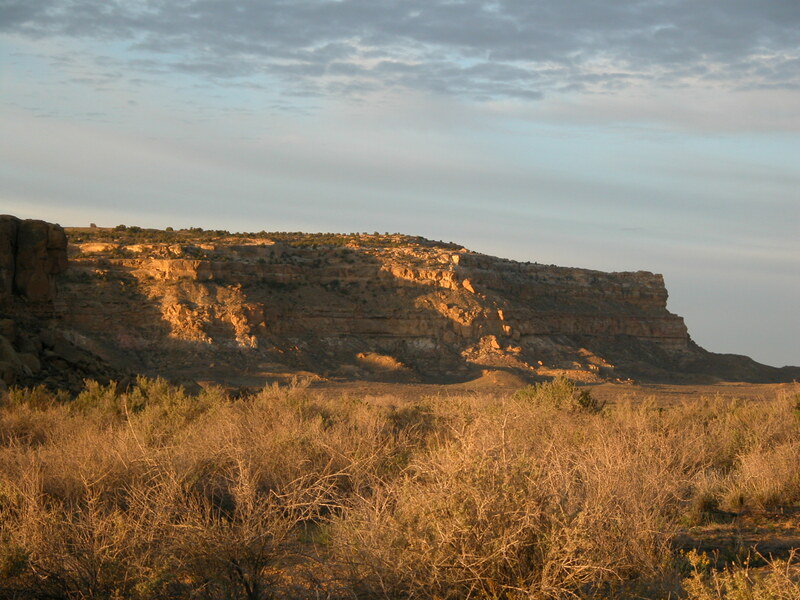 It was said that the timbers used in the construction of the pueblos at Chaco were brought from hundreds of miles away. 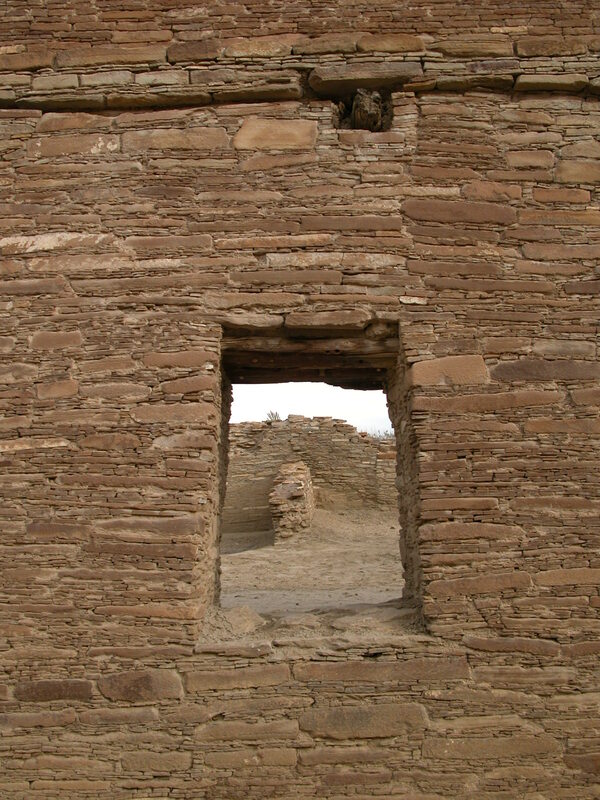 Thousands, maybe hundreds of thousands, of timbers were needed in the multi-story architecture laid out all over Chaco Canyon. The developmental level needed to create and support a “Chaco”, in terms of not just physical construction but societal, painted a portrait more complex than we expected. These vigas were one clue pointing us in the direction of answers, we hoped. 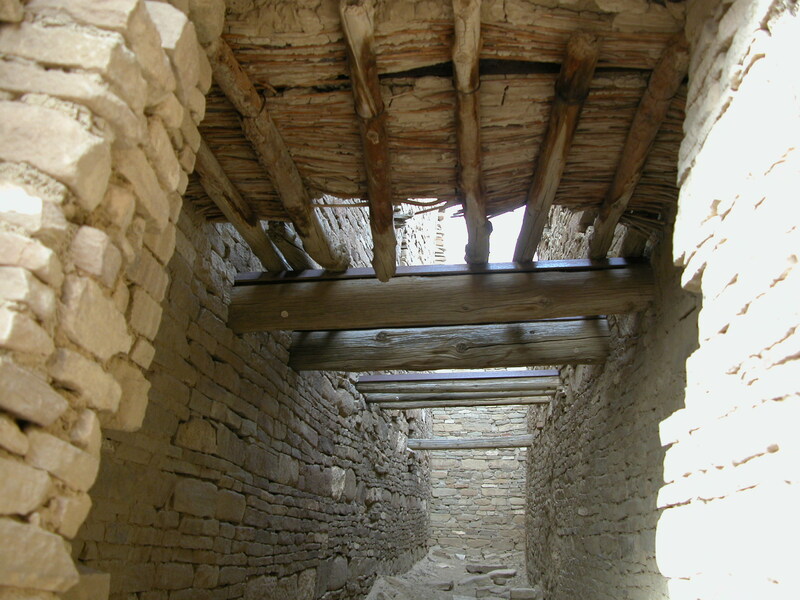 Beam and floor planks still in place at Chaco Canyon after 1,000 years! Indeed, the nearest conifer forests are at least 60-70 miles distant. Sea shells and colorful bird feathers were found in the course of excavating the ruins here. However, the nearest ocean is hundreds and hundreds of miles away: the Pacific at the Southern California Coast (600 miles West), or the Gulf of California between Baja and Mexico (500 miles Southwest), and the Gulf of Mexico (1,100 miles Southeast). Exotic pottery, shells, bird feathers and imported lumber all add up to a network of trade and travel connections indicating at least a Regional Hub and a probably a Spiritual Pilgrimage site out of the pueblos of Chaco Canyon over time. 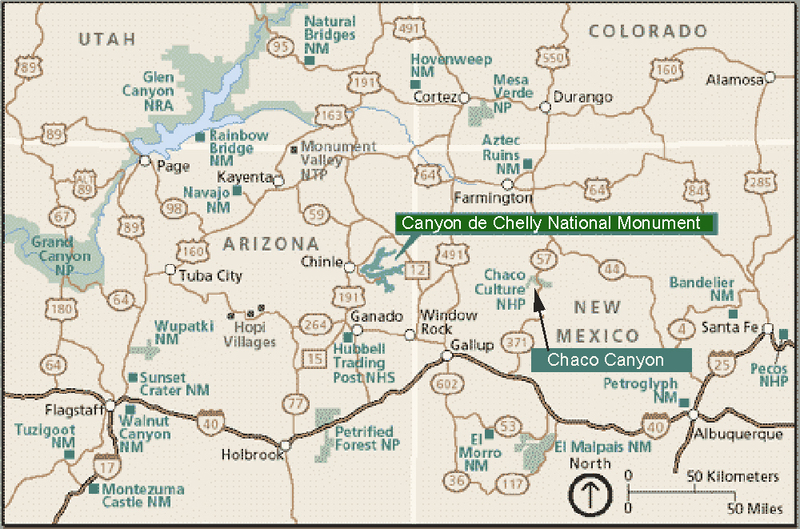 Map of Northern New Mexico and Arizona: Chaco Canyon and Canyon de Chelly Country – Land of the “Ancient Ones”! 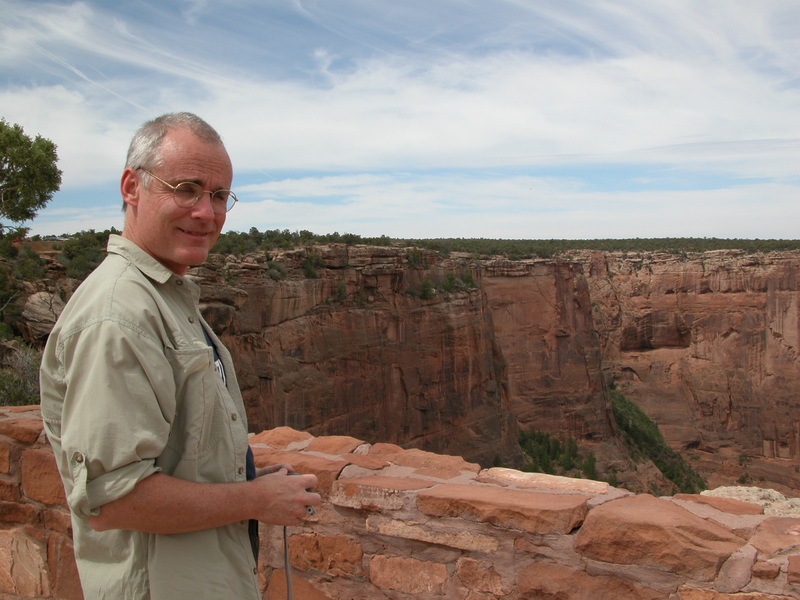 Heading out of Chaco Canyon towards our next destination: Canyon de Chelly! 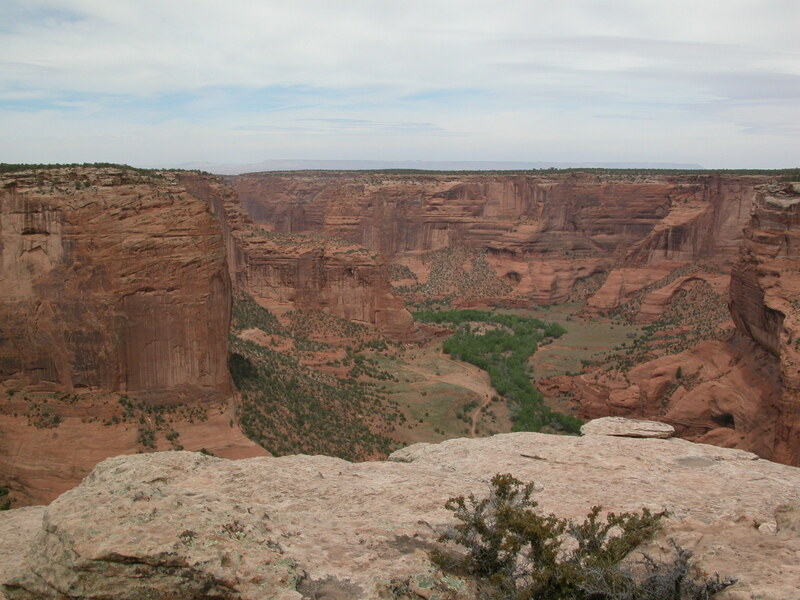 If we were able to travel the prehistoric road directly west out of Pueblo Bonito, about 90 miles as the crow flies, up and over the Chuska Mountains (on the border of Arizona and New Mexico) sprawls the three-canyon National Monument commonly referred to as “Canyon de Chelly”, our next destination. No straight-as-an-arrow path was available for us today, though, for we must follow our modern road system which take us on a wide arcing route through the Four Corners area of Northwest New Mexico and Northeast Arizona, and then south by southwest through vast landscapes. This is true “Indian Country” with towns named Yah-Ta-Hey and Fort Defiance, Window Rock, Navajo and Zuni. Just up-canyon from the town of Chinle, Arizona and outside the main entrance to the Canyon, we settle into the Cottonwood Campground next to the Thunderbird Lodge (with a restaurant and bar!) 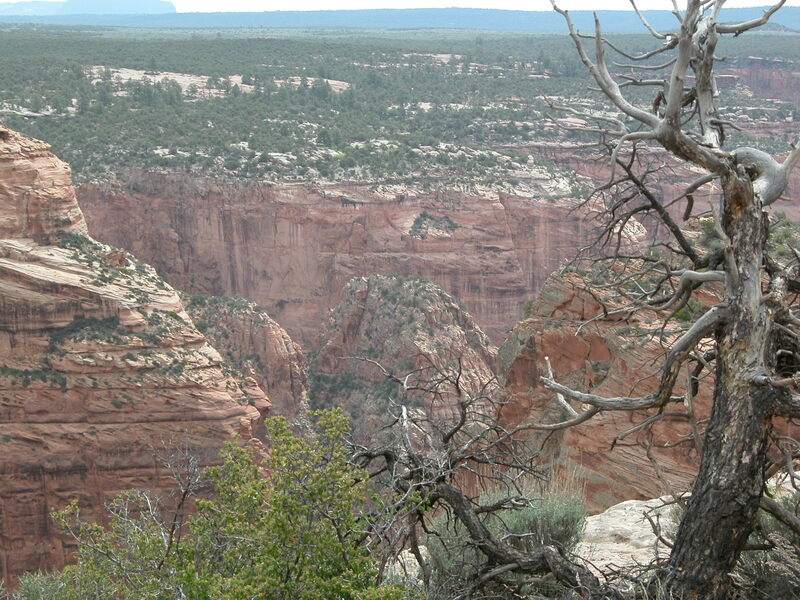 unhitch the trailer and go for a drive to see tomorrow’s horseback trek destination: Canyon de Chelly. 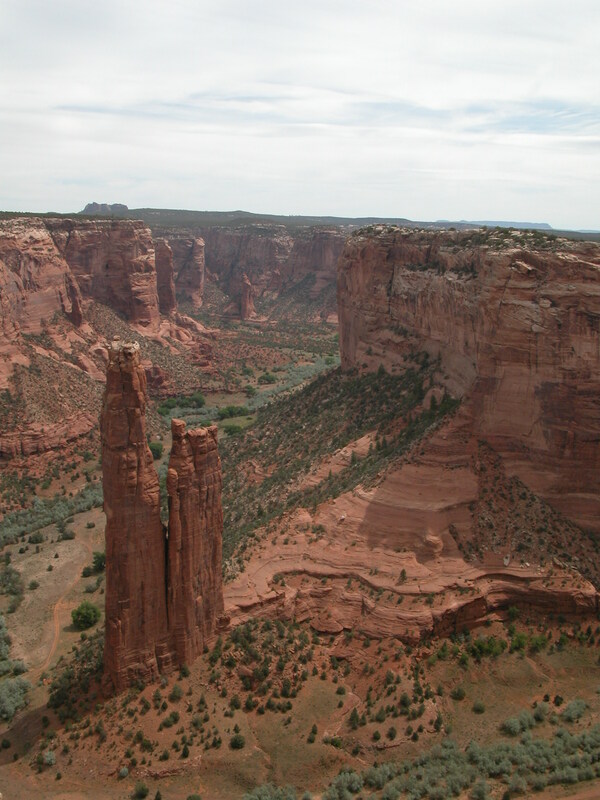 Spider Rock, one of our destinations on our Canyon de Chelly horseback trek. ~ by Dave Etzold on March 13, 2010.